It was my misfortune to stumble upon an action movie, that like so many others, did its part in insinuating Cultural Marxist propaganda into the consciousness of young viewers. Despite my disgust, I persisted in watching it because of its blatantly obvious allusions to the issue of illegal immigration. I wanted to see how Hollywood could use a sci-fi flick to convey their “progressive” message on the subject. In the year 2154, two classes of people exist: the very wealthy, who live on a pristine man-made space station called Elysium, and the rest, who live on an overpopulated, ruined Earth. The people of Earth are desperate to escape the planet’s crime and poverty, and they critically need the state-of-the-art medical care available on Elysium — but some in Elysium will stop at nothing to enforce anti-immigration laws and preserve their citizens’ luxurious lifestyle. The only man with the chance bring equality to these worlds is Max (Matt Damon), an ordinary guy in desperate need to get to Elysium. With his life hanging in the balance, he reluctantly takes on a dangerous mission – one that pits him against Elysium’s Secretary Delacourt (Jodie Foster) and her hard-line forces – but if he succeeds, he could save not only his own life, but millions of people on Earth as well. Someone needs to do a Hardinian review of this movie. We need to take these movies seriously. One movie like this can do as much damage as 10,000 tenured Cultural Marxists in 100,000 college classrooms. In our idiocracy, the masses don’t read anymore. They “learn” by watching videos. Still, I think that for progressives, this movie serves a vital purpose. They are acutely aware of the inequalities of the world, in fact, they make it the staple of their conversation. But they are presented with an ethical dilemma. They don’t like inequality, but they don’t want to give up their material wealth. So they need to find a way of keeping their affluence but expiate the guilt they feel from enjoying it while so many others are so poor. Watching a movie like does the trick. They can cheer on the poor and revel in the downfall of the rich on their TV screens, and then go to bed in their condos with the smug self-righteousness that is their trademark intact. And they can continue to nurse the comforting delusion that there is “enough to go around,” that we can open our gates and “share the wealth,” while still maintaining our middle class lifestyles and cursing Western civilization in the bargain. Al Bartlett’s central point was the power of the “exponential function.” He explained how something that grows constantly, by even a tiny but steady percentage, grows to unimaginable size. So it is with world population, including the US population. An annual increase of 2% leads to doubling in 35 years. A few doublings and the magnitude of the number rises off the charts: The constant 70, divided by rate of increase = doubling time. Thus, imagine that that the people of Elysium, struck by conscience as Liberals and pro-immigration advocates claim to be, allowed the poor to enter Elysium. Suppose that the poor maintained the above-replacement level fertility rates by which they had over-populated and ruined Earth. 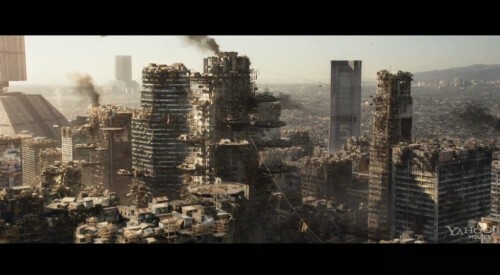 How long before Elysium also turned into an unsustainable, unhealthy, miserably impoverished slum? There you have the fate that Liberals and mass immigration advocates wish on the United States and other developed nations.